Martin Luther King, Jr. Children’s Art Workshop – The Arts Council of Princeton is partnering with the Historical Society of Princeton and the Princeton High School community service group for the annual MLK Day art workshop. 1 p.m. to 3 p.m., Arts Council of Princeton. Free. Barnes and Noble Story Time – Special story time today honoring the Rev. Martin Luther King, Jr. 1 p.m. Princeton Market Fair, Route 1 south in West Windsor. Free. 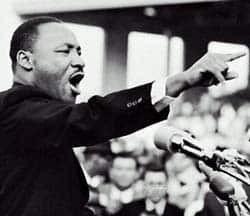 Princeton University King Day Celebration – Princeton University will commemorate the legacy of Martin Luther King Jr. at 1:15 p.m. in Richardson Auditorium, Alexander Hall. Doors open at 1 p.m. Cecilia Rouse, dean of the Woodrow Wilson School of Public and International Affairs, will give the keynote address. The event is free and open to the public. The Trenton Children’s Chorus will perform. University officials will present the MLK Day Journey Award, recognizing members of the Princeton faculty, staff or student body who best represents King’s continued journey. West Windsor Human Relations Council Celebration – “Creating Peace, Love and Understanding in Times of Challenge: Building a Beloved Community One Breath at a Time — A Community Conversation” is the title of the event. The goal is to listen and engage the voices of the community, especially students and youth in the West Windsor-Plainsboro Regional School District. 2 p.m. to 4 p.m. West Windsor Township Senior Center, 271 Clarksville Road. Free. Reception after the program. Princeton Clergy Association Annual Interfaith Service – The Rev. Lukata Mjumbe, executive director of the Presbytery of New Brunswick’s Urban Mission Cabinet and organizer of the United Mercer Interfaith Organization, will lead the service at St. Paul Parish. Mjumbe previously interned at the King Center in Atlanta, and later served a church in Selma. 7 p.m. 214 Nassau Street. Free.